German Man Marries His Pet Cat?!? A man in Germany paid an actress to officiate at the unusual ceremony. Transcript for German Man Marries His Pet Cat?!? 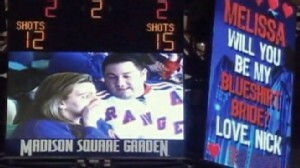 One man's marriage proposal fails at a N.Y. Rangers game, but was it a hoax? A woman turns her fiance's flight delay into an airport wedding in Florida. Iowa funeral home expands business by offering weddings and parties.